Shhh, don’t wake the baby! I mentioned the .22 Uzi carbine a couple of years ago. This more recent photo is alluding to the early 1970s photo of a West Bank settler. 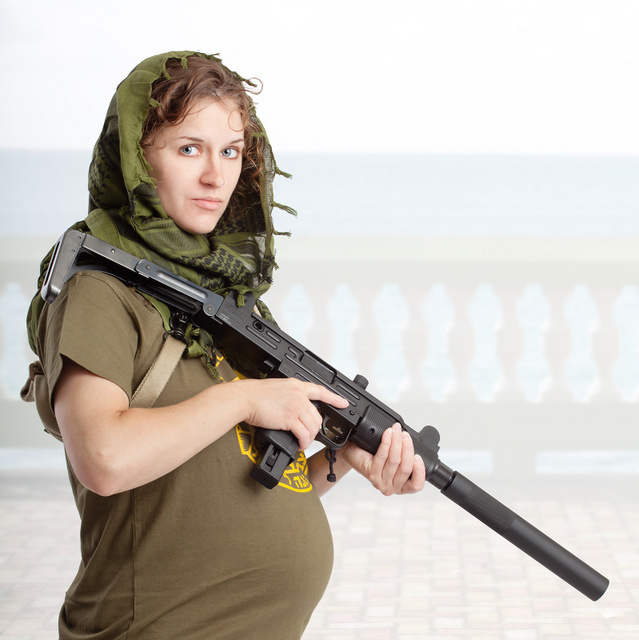 This entry was posted in interesting people, rifle, self-defense, sound suppressor, weapon and tagged 22LR, Israel, pregnant, semi-automatic. Bookmark the permalink. 7 Responses to Shhh, don’t wake the baby! Of course it would be illegal for me to own this device in Israel. Not naming that .22 carbine the “Twenty-tUZI” was a missed opportunity on IWI’s part. MicroBalrog, I had heard that purchase/possession rules had recently loosened in Israel. Hope you get the chance soon. Had an UZI Model B years ago…and mine was possessed. Worst jammamatic I ever owned. That three piece bolt killed the design. When it ran, it was a fun gun. Once upon a time ; I had tryouts with an early UZI with the wood stock and bayonet lug. As long as you used new mags and fed it +P+ ball ammo it ran great. It wasn’t worth much beyond 100 meter but if you used it as intended mine was the berries. It was developed to kill at “mills bomb & shiv” range in the 1950’s . Get a new one made by IMI , feed it right , and clean it and it will still make a good “CQB” machine pistol. I still like the AK better if I gotta haul a carbine.